This small county park’s unique feature is a keyhole dock that extends out into the Indian River/Mosquito Lagoon. 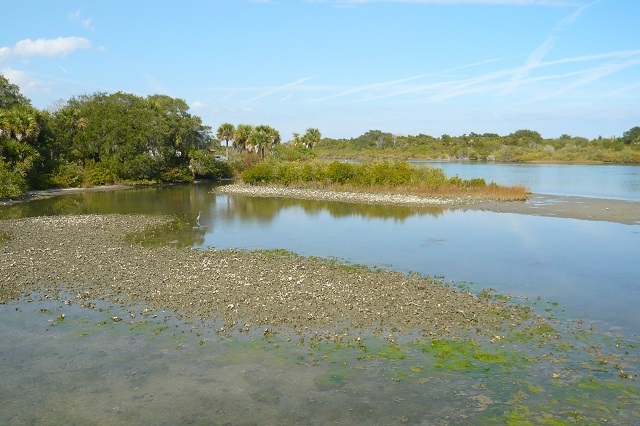 At high tide, the area may seem unremarkable, but at low tide, the mudflats are exposed in and around the keyhole. Here, shorebirds like American Avocet, Dunlin, Red Knot and Short-billed Dowitchers feed close to the viewers above. This is a good site in fall and winter at low tide when exposed oyster bars also host loafing terns, gulls, pelicans and waders like Roseate Spoonbill. Marbled Godwit, American Oystercatcher, Reddish Egret, Common Loon and Black Skimmer are possible. Take the nature trail on the west side of the park and scan the hardwoods for migrant songbirds in fall and spring. Check your tide tables the night before your visit so you can plan your trip accordingly. A boat ramp is available if you’re up for birding the river by canoe or kayak.